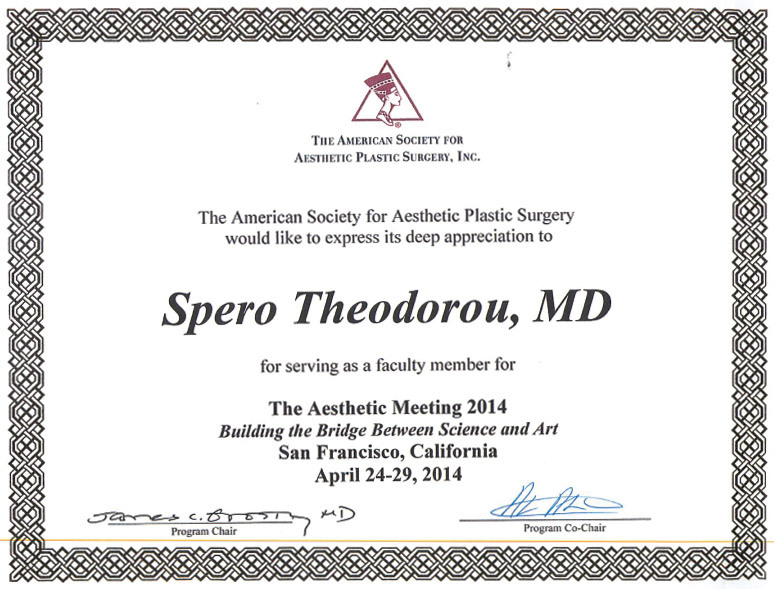 As a faculty member of the American Society of Aesthetic Plastic Surgery (ASAPS), Dr. Spero J Theodorou is actively involved in their activities. He provides training to his peers on various aesthetic procedures. At the ASAPS’ annual Aesthetic Meeting 2014, Dr. Theodorou along with other colleagues presented a course on the topic “Liposuction 2014: New Technologies, Established Techniques, and Combined Procedures,” where the focus was on liposuction right from the fundamentals to the latest advanced techniques. Topics related to anesthesia, established and newer techniques and other important areas were also discussed. The ASAPS event brought together aesthetic surgeons seeking to strengthen their learning experience through comprehensive courses and valuable interaction with their peers and mentors. The participants also benefited from sharing innovative insights regarding the possibilities of cosmetic and plastic surgery.